There is no doubt that social networking websites and applications like Facebook have made communication faster and easier. Here you can connect to your friends and family members through messaging, voice calls or video calls within few seconds. But, your private chats, messages, photos etc. can be at high risk of the privacy breach and identity theft if you do not secure your Social networking accounts properly. Any hacker can hack your account, get your password, log into that and can misuse your account. Some common attacks like phishing are practised and the accounts are being hacked. So protecting our Facebook accounts is a major concern. To authenticate an account, the Username and password are not enough nowadays. There is a need for another layer or step of verification, and that’s where Two-Step Verification is introduced. 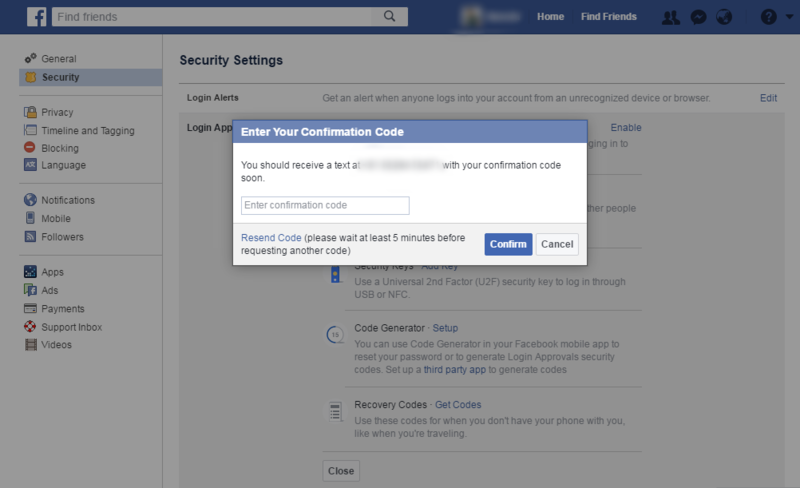 Enable Facebook Two-Step Verification with these 4 simple methods. Two-Step Verification is a security measure that requires an extra code when you log in. 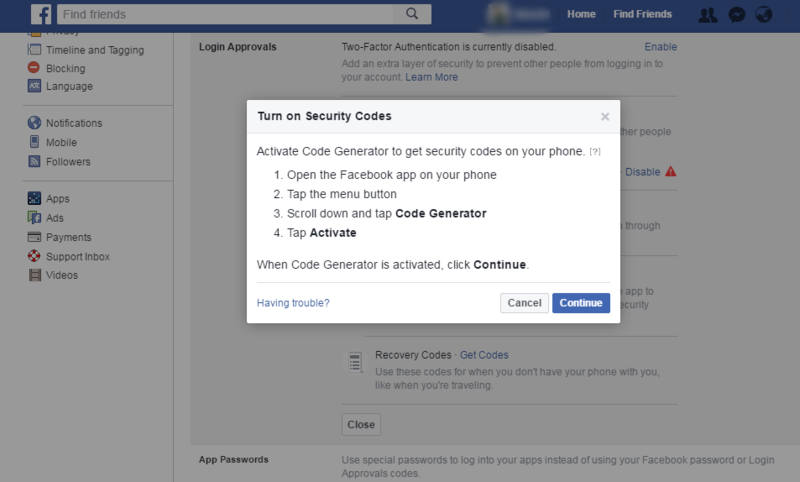 When enabled, Facebook will require a code from your mobile phone during login. This code is created by the Code Generator tool in the Facebook app. You can also have it sent to your phone via SMS. So even if a hacker knows your username and password, he/she can’t access your account without the code. Step-1: First of all login to your Facebook account. 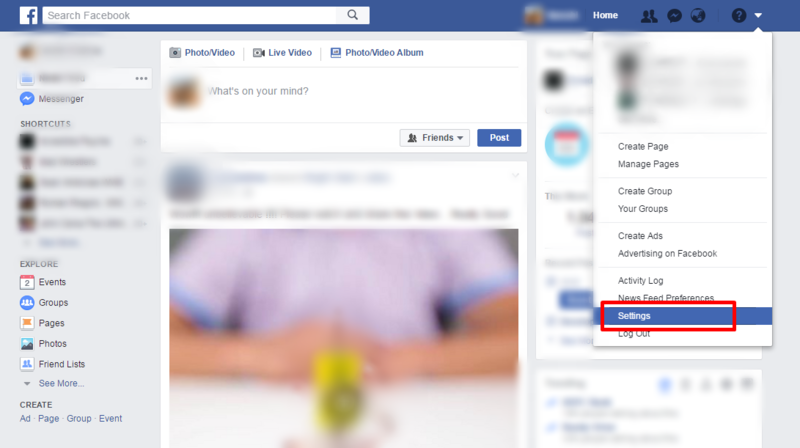 Step-2: Now click on the down arrow button available at the top right corner of the Facebook main page. A drop-down list appears, select the setting option. Step-3: Here, in the sidebar, it displays many option tabs such as General, Security, Blocking, Mobile, Followers, Privacy and so on. Click on the Security tab. Step-4: Security page content will be displayed. Here, you have to select the Login Approvals Link button. Step-5: On the Login approval page, you can see four options such as Text Message (SMS), Security Keys, Code Generator, and Recovery Codes. 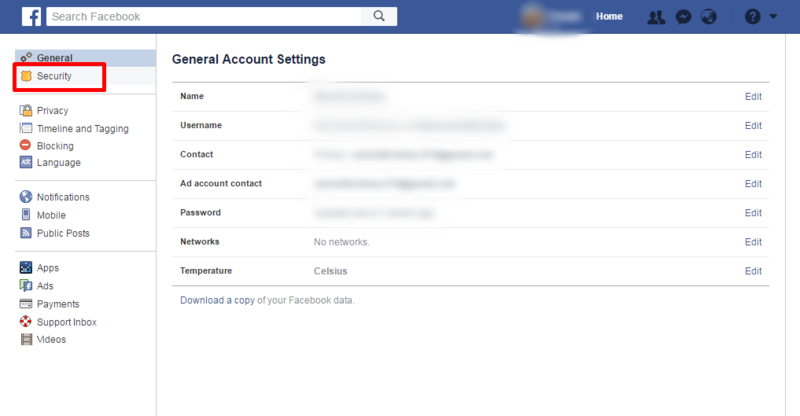 Step-6: On clicking on Add Phone beside Text Message button, Facebook will ask you to enter your mobile number. Type your mobile number and click Continue. 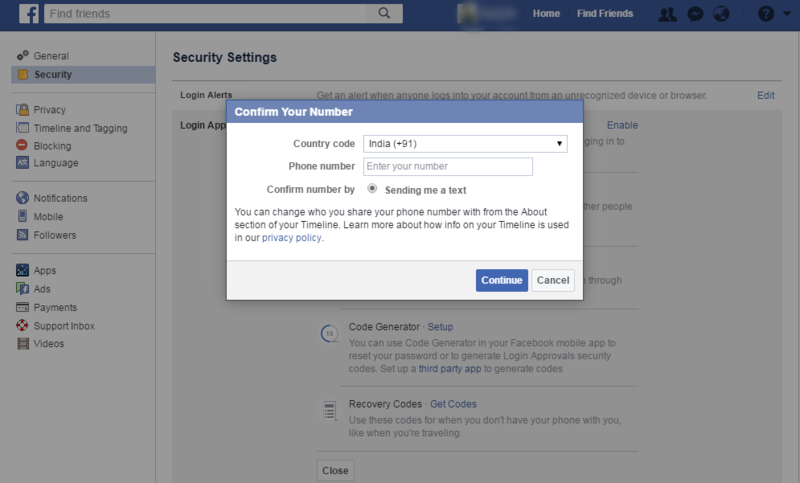 Facebook will now send you a code to your mobile number. Just type that code and that’s it. Step-7: After that, you will be asked if you want to activate login approval immediately. So, in case you do not have your phone with you then you can bypass the code for one week. And after one week you will be prompted for the code. 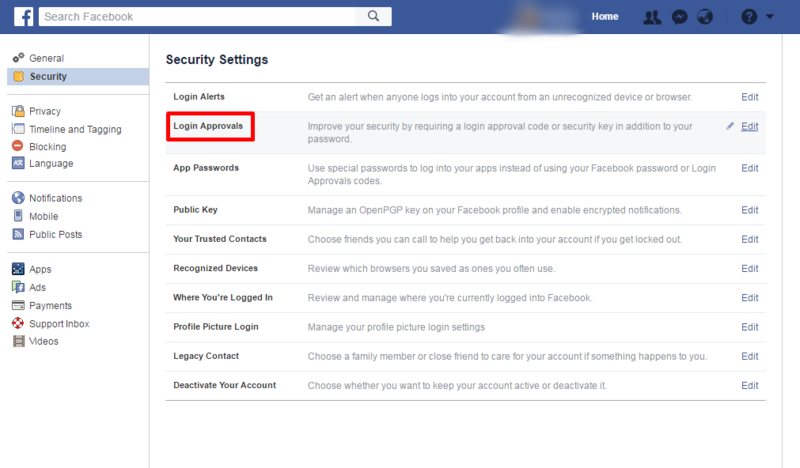 Step-8: Now whenever you log in to your Facebook account, it will send you a verification code to your registered mobile number. Only after entering that verification code you will be able to login to your account. Use a Universal 2nd Factor (U2F) security key to log in through USB or NFC. 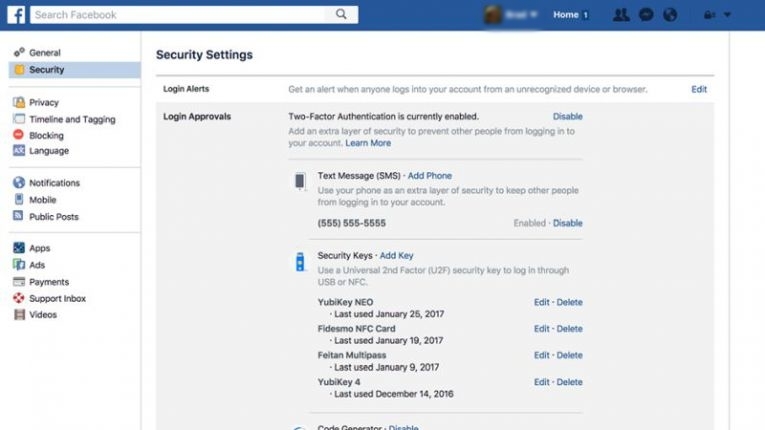 It is a physical device that makes signing into your Facebook account more secure. After registering a security key, you can sign in by inserting the security key instead of typing a verification code. Step-1: Here, you have to click on ‘add key’ tab beside Security Keys. 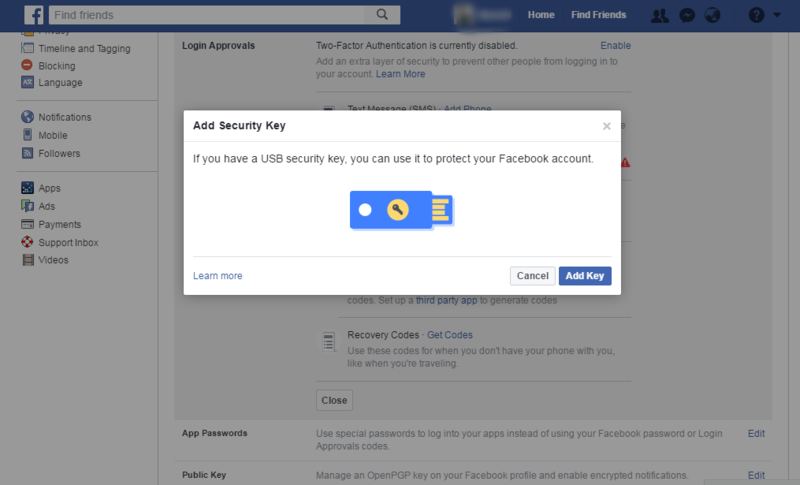 Step-2: If you have a USB security key, you can use it to protect your Facebook account. Step-3: Insert your security key into a USB port. If the key has a blinking light, press the button or gold disk. 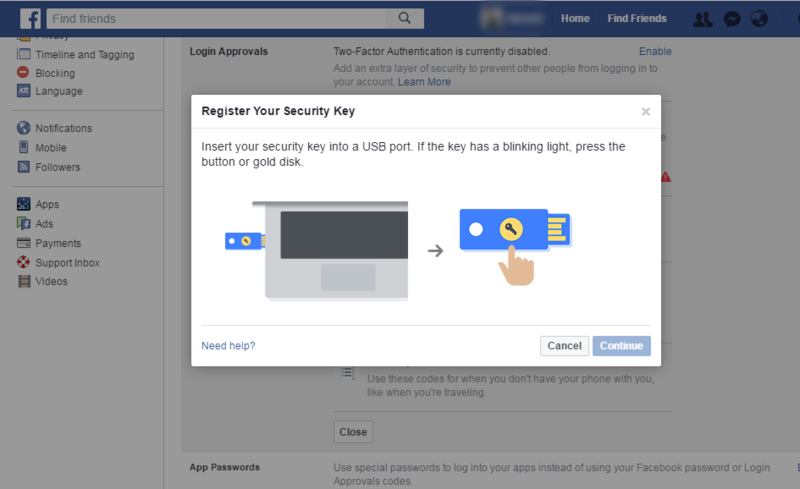 Step-4: Next time, whenever you log in to Facebook, you have to insert the Security key. Step-1: Here, you have to setup code generator by clicking on ‘Setup’ or Add Key. Step-2: Now, click on “Having Trouble?” link. Step-3: In the new pop-up, click on Get Key. 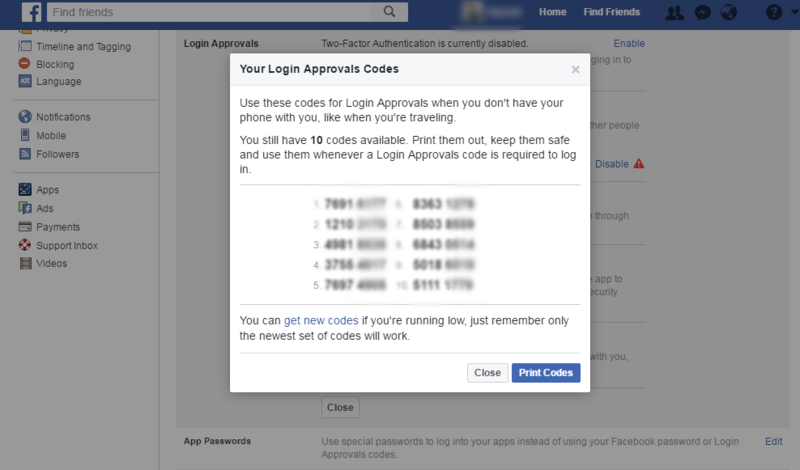 Step-4: Facebook will show you a 16 digits keys. Step-5: Now, Open the Authy App and click “+ Authenticator App”. Click “Enter key manually”. Note: Use Authy to add a new layer of strong authentication to the online apps you use every day, like Facebook, Google, Dropbox, Twitch.tv, and many others. With Authy you have secure cloud encrypted backups so you will never lose access to your tokens again. Step-6: Enter 6-digits you see on the screen and click continue. Step-7: Click Finish. You are done with Code Generator. Step-1: Click on Get Codes beside Recovery Codes. 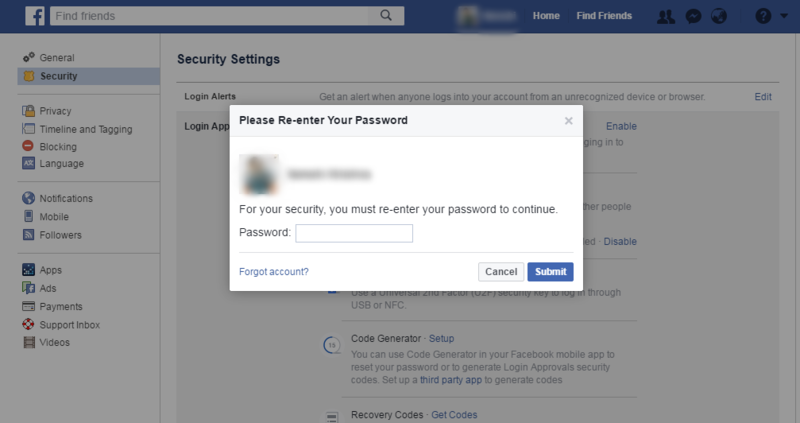 Step-2: A pop-up comes where you have to enter your Facebook login password to get the recovery codes. Step-3: Here you will see 10 codes generated in which you can enter any one of them to log in to Facebook next time. Once, all the codes are used, you can ask for more codes by pressing ‘get new codes’ below the list of codes displayed. 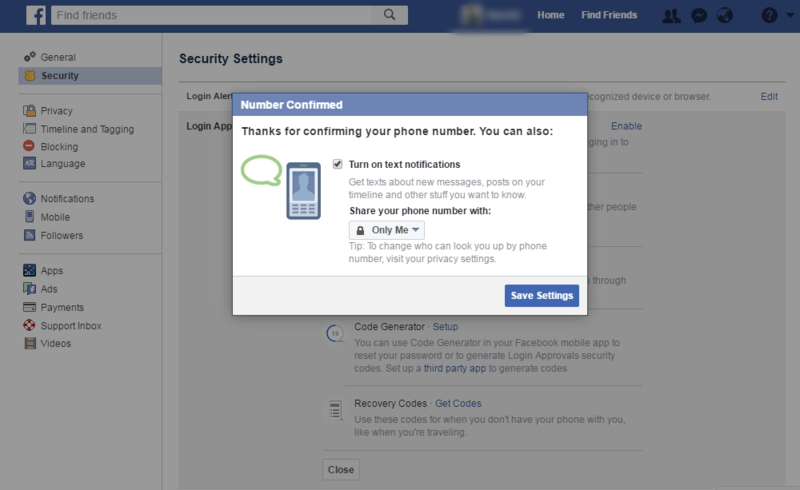 These are the 4 simple methods where you can turn on Two-step verification in Facebook. 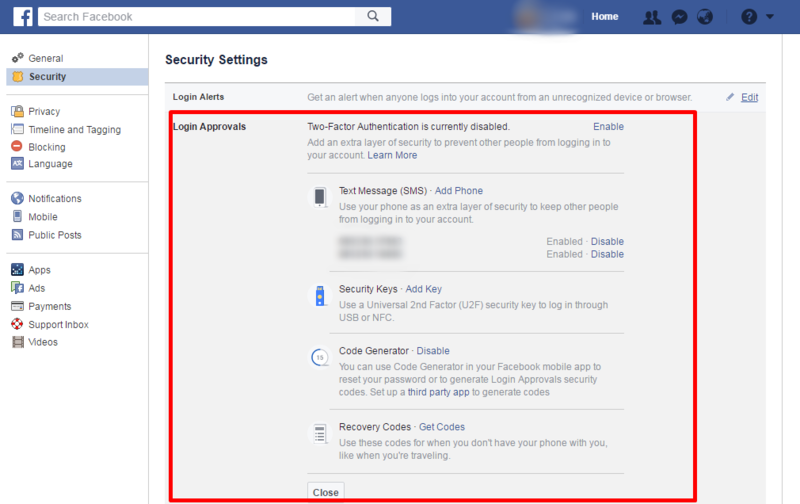 Enable now and increase your Facebook account security. If you are facing any issues while following any of the above methods, kindly let us know in the below comments. 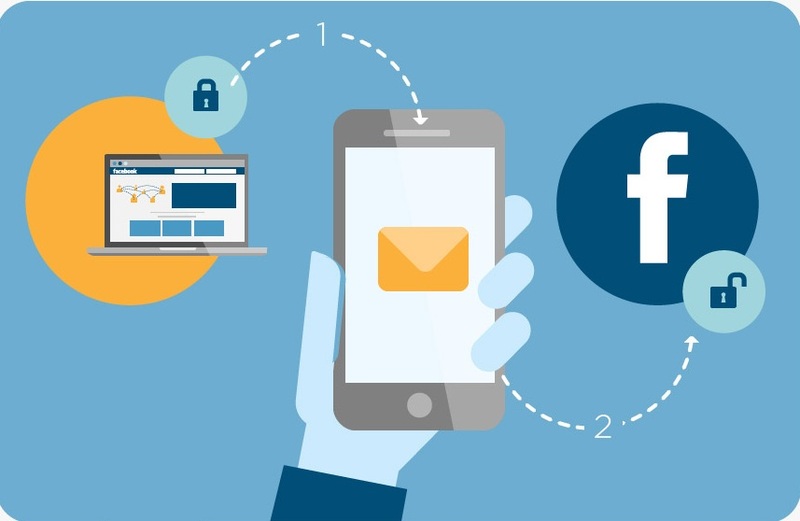 Which method are you using as Facebook Two-Step verification?